The restios and grasses look so inviting for the buck, which would have been driven to the edge of the fire, and struggled to find shelter and food. 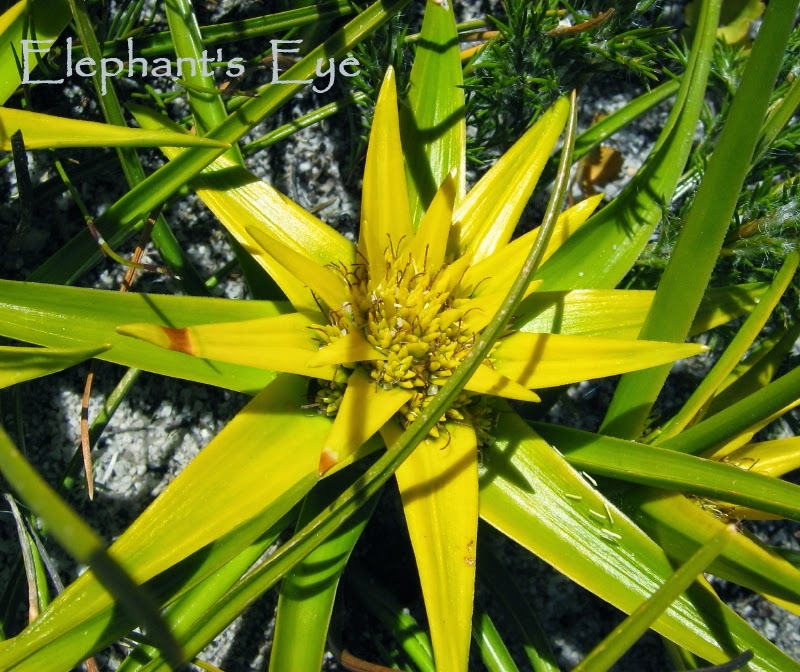 Ficinia radiata, a sedge, scattered the whole Groot Winterhoek Wilderness Area with gold stars for Christmas! 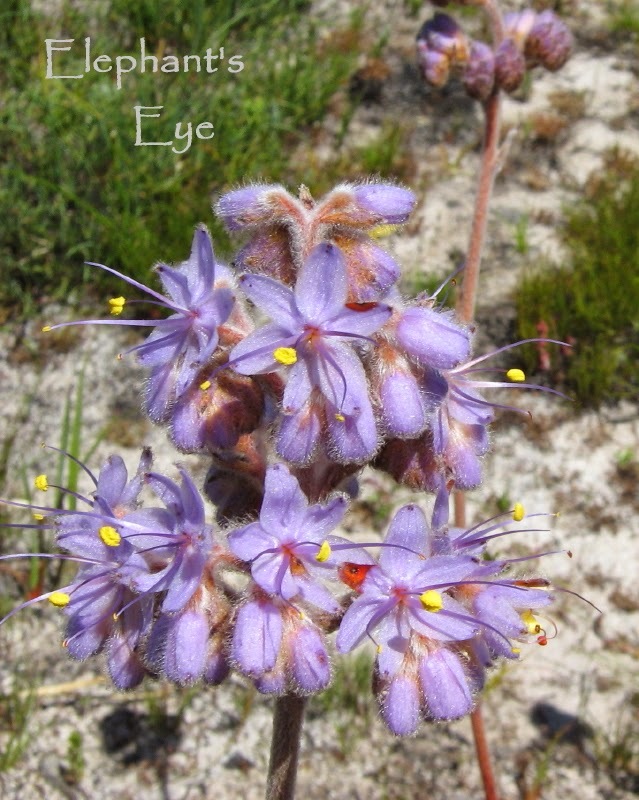 From PlantZAfrica - In the genus Ficinia almost all 60 species are endemic to the Cape Floristic Region. 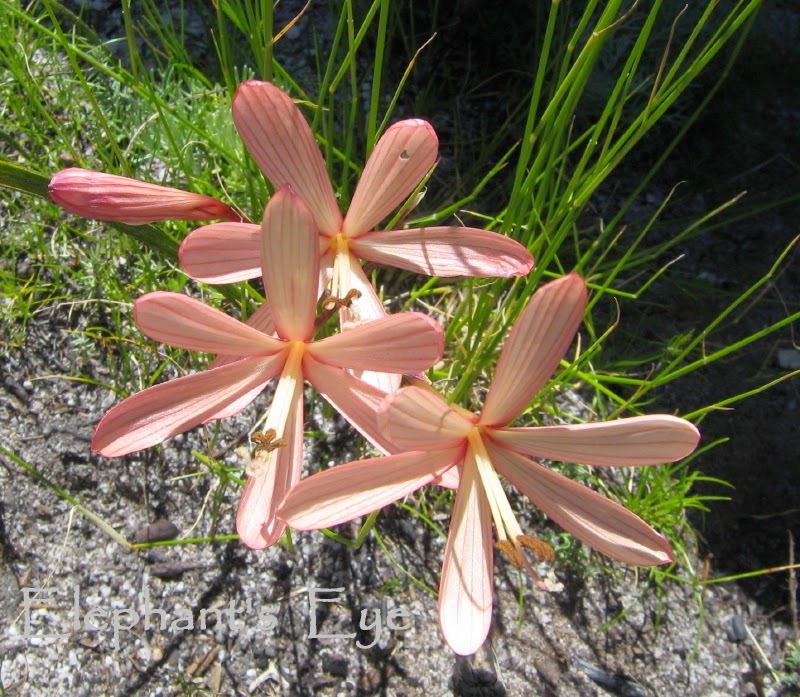 Ficinia is a characteristic genus of the Cape fynbos. 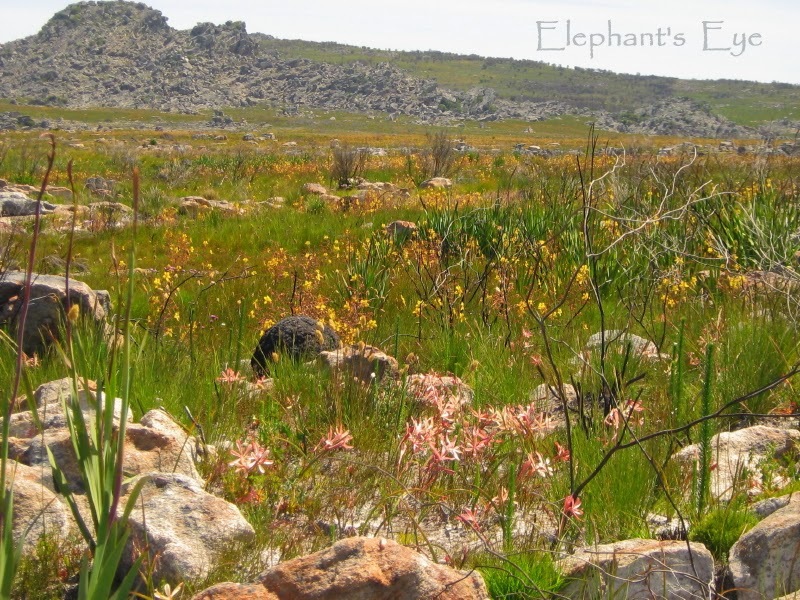 Thirty-three species in the Cape Peninsula alone. An elaiosome (the appendage on the seed that is rich in oil) attracts ants, that drag the seed into their nests underground. The ants eat the elaiosome and leave the seed in the nest, where it can germinate safely. In the fire-dependant Cape flora this is important as the seed is also protected from the heat of the burn. Dilatris pillansii was new to me. Misty mauve flowers floating about half a metre above the ground. 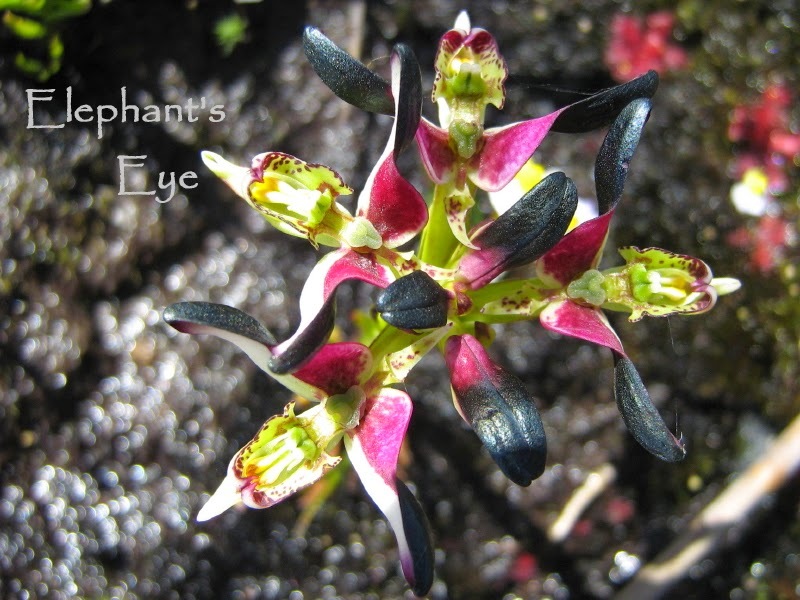 But many flowering plants are only seen, with the first rain after a fire. On our burnt mountain we saw swathes of colour. Getting closer, two plants dominated. Golden yellow Wachendorfia paniculata. From PlantZAfrica - The pollinator is unknown and its pollination biology is a bit of an evolutionary puzzle. The flowers produce a generous amount of nectar that is easily stolen, with the thief not having to get anywhere near the pollen or stigmas in order to get at the nectar. The black seeds are hard but light in weight and are densely covered in short coarse hairs which give the seeds a fuzzy outline. They also float on water, and given the riverine habitat of the plant, this is probably an adaptation for water dispersal. The Haemodoraceae, or bloodwort family, gets its rather alarming name from the red cell-sap found in the roots which colours the rootstock red (haima is Greek for blood). Haemodorum is the Australian genus on which this family is based. 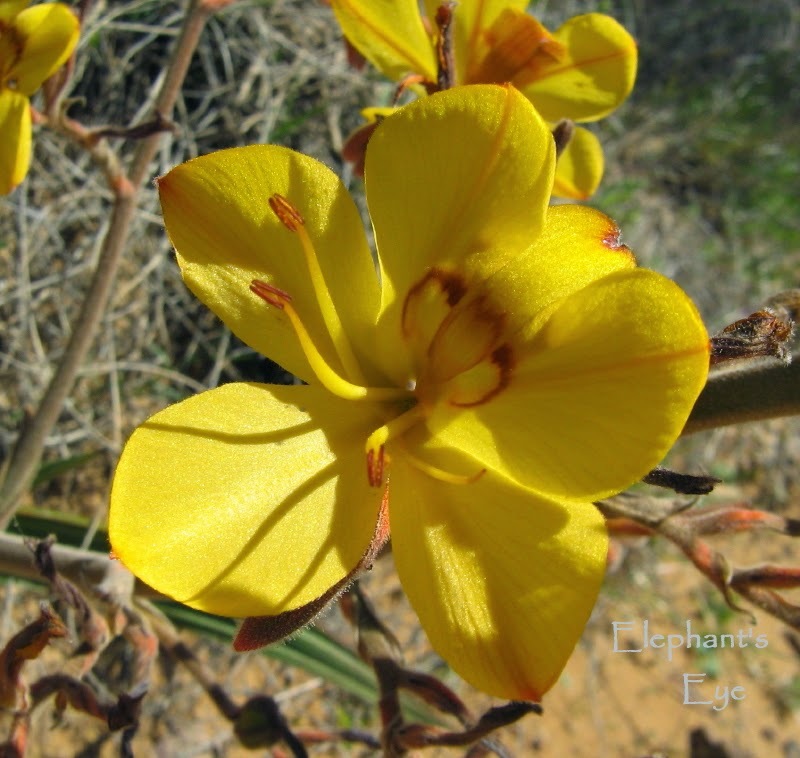 The Australian Anigozanthos is the kangaroo's paw. Not as dominant, were clusters of apricot Geissorhiza, from the iris family. On the patches which are still exposed from the fire, the ‘soil’ is gritty blinding white quartz gravel. From the Table Mountain Sandstone. 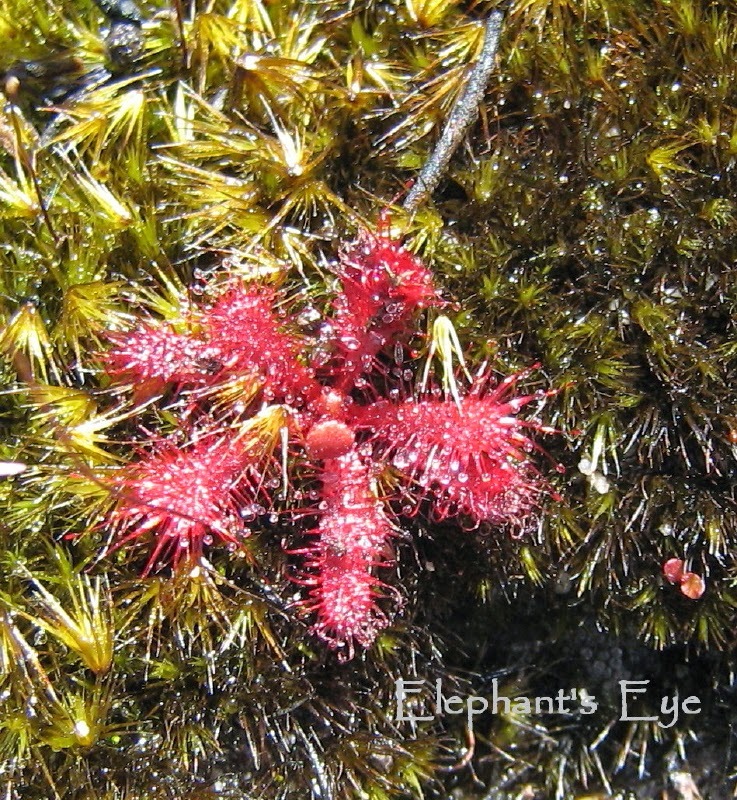 This is not fertile and the sundews supplement their meagre diet with insects. 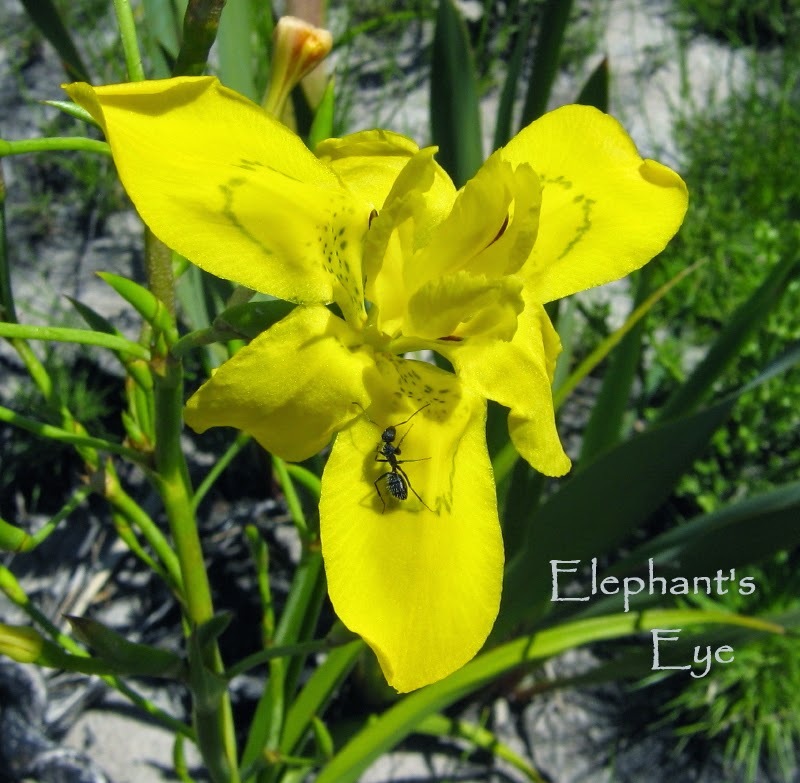 Ants are vital to the survival of the fynbos. This ant is on a Moraea neglecta flower. 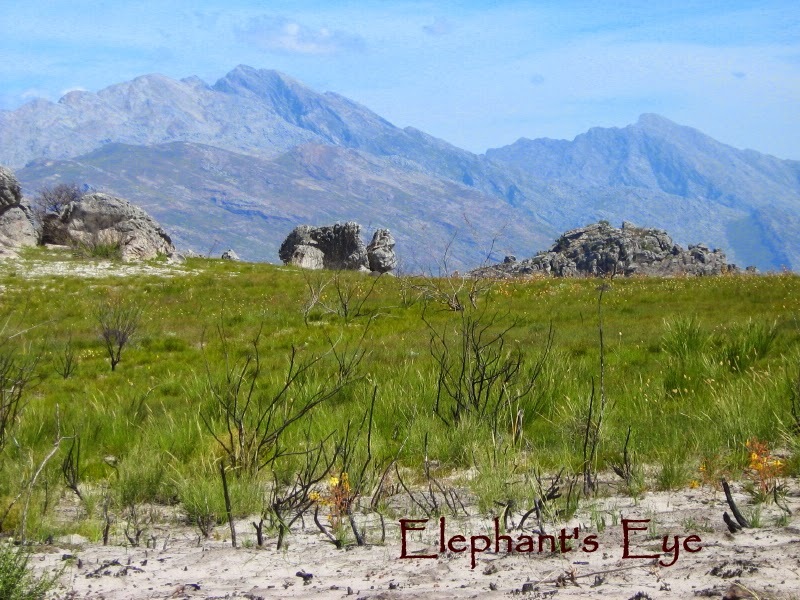 A lingering gaze at the Groot and Klein Winterhoek. With snow in June 2013. Sunshine and firelight in August 2014. Porterville is famous for yellow disas. Sadly most of that colony were poached, so I was loath to show these pictures of Disa atricapilla when they were in bloom. Now I hope the plants are safe! In November 2009 Carrie wrote - It always amazes me what beauty comes out of fires in nature. Makes me think that we as people should have a cleansing of the clutter and the choking stress that takes all our light and room to grow. Maybe underneath we too have an aray of simple little pleasures that just needed space to show themselves and brighten our world. That fits me well, as we are days away from living on False Bay. Such resilience and diversity. The yellow disa is beautiful. It's amazing what pops up after a fire! The same thing happens here in our prairies--some of the plants actually need the occasional burn. Thanks for sharing photos of your beautiful wildflowers! As a plant ecologist who studied wildfires, I know intellectually that they are the phoenixes of ecosystems dependent on fire. Yet I am always astonished by the diversity of plants that appear after a wildfire, including as with your beautiful photos of your fynbos after the 2009 fire. Perhaps your move will be like the fire, bringing you beauty you had never seen before. Blessings! I was not familiar with Disas. So beautiful! And sad that they are poached. It's a sort of magic to see how plants embrace fire and return in splendour. Diana, if I read your posts I always learn a lot. And that's also what I realy love! When you call the Ficinia a sedge, do you mean the sedge family (Carex) we know in North America? Anyways, it always amazes me that anything can flourish after a fire, but nature is resiliant isn't it? 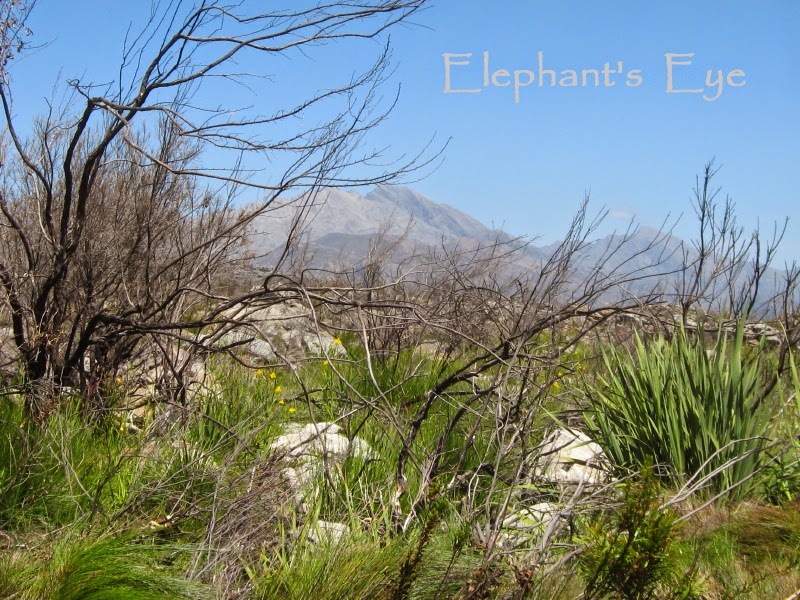 Fires are always shocking, but not everybody knows that its needed for Fynbos every now and then. This is why I love nature...how life comes out of fire and the way ants act as pollinators...they do the same for many of my spring native plants. I love the colors of the Disa atricapilla. Nasty how someone poached them.